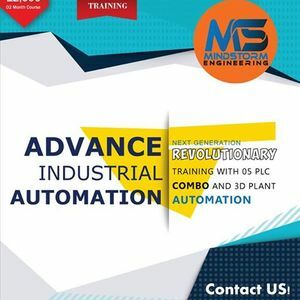 We are one of the leading Automation Institute in Pakistan offering hands on lab sessions in our state-of-the-art lab equipped with latest tools, equipment and qualified instructors. 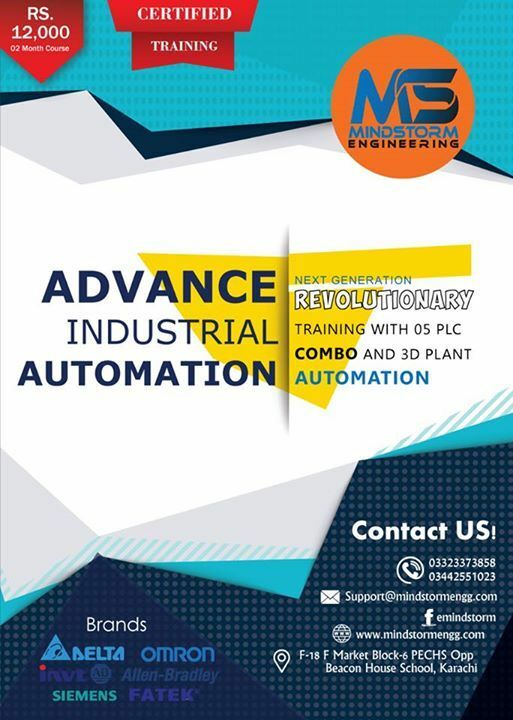 We aim to bring industrial revolution in Pakistan by our smart integrated automation solutions and grooming engineers in the field of Automation. -In depth programming on Siemens and Delta PLCs including 150+ Application Examples, Industrial Examples, with Analog/PID Programming, High Speed Counters, Online troubleshooting, Maintenance. Hands on wiring on Delta and Fatek Modules including Sink/Source, Sensors interfacing Npn/Pnp, Relays, Switches, Lamps, Analog Sensors (IR/Ultrasonic), Temperature Sensors (RTD). Wiring simulation on Automation Studio, Control Schematics on Visio. - Visual Monitoring and Control, Set Points, Display Elements, Alarms, Historical Data, Graphs, Multiple Screens, Real Time Application, 20+ Industrial Examples, PLC-HMI Communication. -Understanding of Diagram, Wiring with Motor, Selection of Drive, Parameters Configuration and Selection, Source of Frequency, Acceleration / Deceleration, Motor Tuning, Speed Adjustments, Modbus Communication with PLC, Encoder Feedback (Phase Z,A,B), Fault Tracing and Troubleshooting. - Basics of Compressor, Pressure Regulators, Pressure Gauges and Switches, Solenoid Valves, Cylinders. Operation through Siemens S7-300, with protection using Limit, Proximity and Reed Switches. Pressure, Water Level, and Temperature Control using Honeywell Process Controllers and Omron Level Controllers. P&ID Diagrams and operation of Pressure transmitters and control valves. Application Example on Boilers Feed Water Tanks. Plant Simulations and Projects using PLC, VFD, HMI and Sensors/Actuators. Certificates will only be awarded to students successfully completing projects, case studies, quizzes and assignment’s. Working professional automation engineers with combined 10 years of experience and more than 100 successful industrial projects. Experts are from Oil n Gas, Textile, Power, Packaging and Service Industries. Professionals from 70+ Pakistani and Foreign Industries including Oil n Gas, Textile, Power, Process n Manufacturing, Packaging, Pharmaceutical, Tile, Cement, FMCG, Services etc. Partner Institute with multiple industries and universities for in house training sessions for Capacity building of students or employees. *up to 15% discount on group of students. No discount for professionals. **Basic knowledge of Electrical/Electronics is pre-requisite for this course.